The more I know about your company and the way you intend to use the material, the closer I can come to providing the right material for your job. I interview the builder and modify the computer estimating system according to Builder’s material specifications, usages, field requirements, delivery sequence, etc. The estimate will be no better than the information provided or the plan submitted. Information not on the plan must be presumed. Presumptions, like assumptions, cost money. Therefore, it is strongly recommended that the Builder submit a complete set of plans including all engineering layouts. We can produce layouts for the Builder for his acceptance, but as we are not engineers, the value of this is limited. In any event, we will document the Joist and Rafter engineering provided in detail according to material type, species, dimension and length. When given ‘layouts’, we can ‘optimize’ joist and rafter requirements to deliver the shortest piece of lumber necessary. The details can be used by the Framer to properly use each piece of lumber. When performing a Material Takeoff, many material items and construction processes must be reviewed and identified. Often, through this process, plan errors, specification discrepancies, dimension and sizing problems are identified by the estimator. 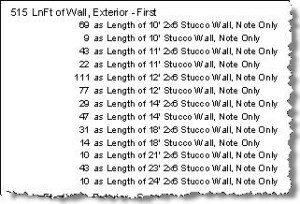 We document these items on the plan and within the estimate so that the Builder can address them BEFORE construction begins. We quantify every aspect of your project – which means that we actually measure and count – unlike a quick lumber “guess-timate” that others might produce cheap or free. Yes, measuring and counting takes time – more time than a quick takeoff would take – and it costs a few pennies per square foot more. But the benefits to spending the extra time are to your bottom line. More detailed measurements and calculations means greater accuracy and fewer short orders – time and money saved for you. We estimate your project according to your needs. Typically, we perform a ‘Frame Lumber Takeoff’ that includes Form Lumber, 2″ Framing Lumber – including stick built roof, Sheathing, Cornice, Roof Decking, Shingles and Brick. We provide the estimate as a series of ‘Bid Forms’ that are intended to be filled out by the Bidding Material Suppliers or Lumber Companies. These are separated according to the Builder’s own unique Delivery Requirements. Each Bid Form is then broken down according to material usage or location. In this way, the Builder can cross reference the estimate to the detail on the plan. Usually the Builder wants the estimate delivered immediately upon completion of the estimate. Since the estimate is produced by computer, we fax or e-mail the estimate from the computer to the Builder and his Lumber company at no extra charge. We also can deliver the estimate as an Excel spreadsheet. Note that the Builder still must review the plans and the estimate prior to accepting it. Arrangements can be made to have the plans delivered to the Builder or the Builder may pick up his plan at my office. We are glad to hear from the Builder regarding implementation of the Estimate. It helps us a great deal to know how quantities estimated met the actual jobsite requirements. We know that we are on the front line of cost control. We can assist the Builder to identify reasons for overages or shortages and modify systems according to the Builder’s Individual Requirements. The Estimating process is always evolving according to the Builder’s unique methods.